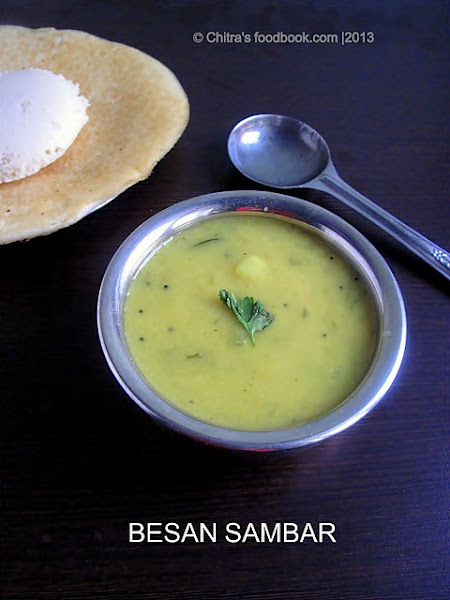 Besan sambar/ Kadalai maavu sambar is a very simple and tasty sambar recipe for idli & dosa. Ideal for bachelors and working women to prepare in busy mornings and lazy nights.We call this as Kadala maavu sambar in Tamil. Its a quick and no dal, no vegetable sambar for idli. You would have heard about Bombay chutney. This recipe is similar to that. It tastes good with chapathi too with slight variations.Check notes section for variations. Soak tamarind in water and extract pulp from it.Dilute the besan without lumps adding required water.Set aside. Heat oil in a kadai and add mustard seeds.Once it starts spluttering add urad dal, a pinch of hing and curry leaves.Add finely chopped onions, slit green chillies ( Or add sambar powder along with tamarind extract) and saute till onions become transparent. Add some water and cover the kadai with a lid. Onions will get cooked nicely. Now add the besan water, tamarind extract, ( Sambar powder if using) with salt and 1/2 cup of water. Add 1/4 tsp of hing and turmeric powder. Bring it to boil.Gravy may become thick. So add some water in between. It should boil till the raw smell of besan leaves off completely. Check for taste and add more salt if needed. Finally, add the coriander leaves and serve hot!! This sambar should be watery.So add water whenever gravy becomes thick . We should add asafetida/hing, 1/8tsp while seasoning and 1/8 tsp during boiling! !This gives the flavor for the dish!! So I mentioned twice to add hing. If you use sambar powder instead of green chillies, color and flavor of this sambar will vary. Note: For chapathi, we follow the same procedure but instead of tamarind extract ,we use lemon juice or tomato pieces.Gravy should be thicker than this.We add lemon juice at the end i.e. after removing from the flame. Delicious sambar is ready to serve hot with idli & dosa adding sesame oil ! Wow never tastes this before. Something new to me. Looks yummy. Sounds similiar to Bombay chutney or Besan chutney that I have had in the South. Lovely entry to JFI Chickpea. What I like abt hosting JFI is the opportunity to meet new bloggers!